Is Blockchain Coming To Excavating? Home Uncategorized Is Blockchain Coming To Excavating? One of the biggest buzzwords of the last few years, “blockchain” seems to be getting attached to both tech-centric industries as well as legacy industries. It’s still a pretty obscure word for many people, who have heard it but might not fully understand it or know what it is used for. It’s a concept that may be hard to grasp at first, but you’ll need to – it’s becoming obvious that it’s not going anywhere. A blockchain creates a ledger than can grow and be added to by numerous parties, but can be difficult to edit or alter retroactively. This is thanks to every block in the chain containing all the information of the previous block – a cryptographic hash of the block, a timestamp, and any transaction data. While first proposed in 1991 as a way to time-stamp a digital document, it took quite a while to evolve. The idea of blockchain as we know it now stems from Satoshi Nakamoto, a person or group of people who are credited with developing and deploying bitcoin. Implemented in 2009, it has helped to spawn research in blockchain across numerous industries, with everyone from IBM, to JPMorgan, to Facebook developing uses for blockchain and cryptocurrencies. It is being evaluated for potential voting usage, as well as insurance usages such as peer-to-peer insurance and microinsurance. Currency Transactions: Simply put, it allows for utilizing cryptocurrency for payment. Whether it is an existing cryptocurrency or one in the future, there’s a chance that companies will be asked if they accept cryptocurrency as payment. For some, this could mean added working opportunities – Puerto Rico is being hailed as a potential cryptocurrency hotspot in the future, where many cryptocurrency evangelists hope to create an economy that eliminates fiat money. If you want to work in Puerto Rico, you may need to accept payments in cryptocurrency. Smart Contracts: From hands-on work to shipment and delivery of goods, blockchain working on an if/then principle can help develop project tracking and contract administration. In the former, a tradesman can simply mark a step as being done, triggering for inspection from the contract administrator. The administrator can then inspect the project at will, and then can trigger payment by signing off and releasing funds from escrow. It reduces communication issues and allows for faster transaction and contract completion. In shipping, this can allow for a company to buy a large piece of equipment – say, a new grader or dozer – directly from the supplier and stagger payment and change liability easily. Payment could be released in stages when certain blocks are met, like the machinery leaving the plant or arriving in a new port. Liability could change hands as well, from the producer to the shipping company or companies, to the purchaser. All of this could be done without phone calls or dealing with middlemen. Maersk, one of the largest shipping companies in the world, is already experimenting with blockchain integration. Decentralized Autonomous Organization (DAO): It’s a very wordy phrase that essentially means different Smart Contracts linking together through the Internet of Things to create autonomy in a project. Using the if/then controls from the Smart Contracts, the DAO could trigger stages of the project, allowing the client and different members of the project team to conduct everything from designing and monitoring to certifying and handing over the project, all the while releasing payment and approving stages throughout the project to keep workflow and payments moving. 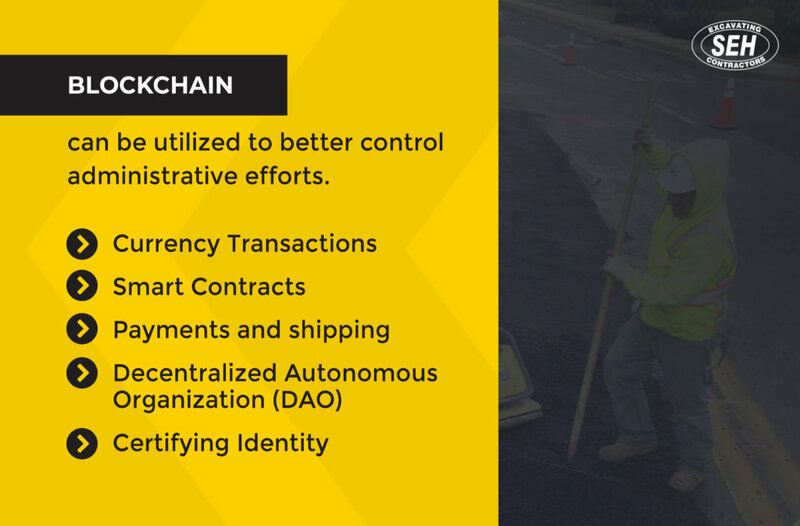 The blockchain would be capturing project governance along the way, and would be able to track capital transfer and ownership of the project. Certifying Identity: Often, projects need proof of membership in professional bodies so that a company can self-certify work. Other times, security clearance may be needed to bid on and work on projects at airports and school, while many government contracts may require a level of background checking. Blockchain could be used within a Digital ID that the company can share with potential project administrators that spells out qualifications, clearances, and even links to previous contracts that can be verified for performance. With such a new technology, there is plenty of exploration yet to be done as far as to the extent it will be useful, as well as if blockchain will fit logically into the organization and administration of construction and excavating companies. There is potential for it to be involved in how we manage projects, but that is still years in development. 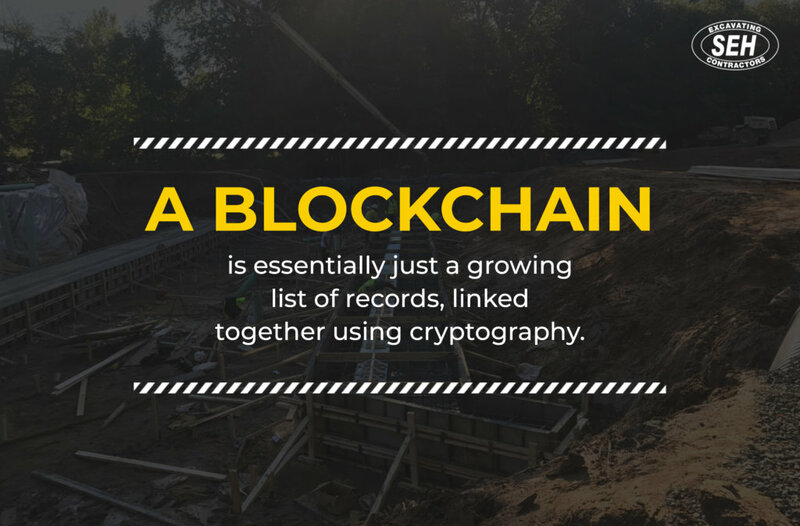 Here at SEH Excavating, we’ll be keeping our eye on blockchain, as we do with all technological advancements. That’s how we ensure that we stay on the leading edge of excavation tools and methods – by always keeping an eye on the horizon.